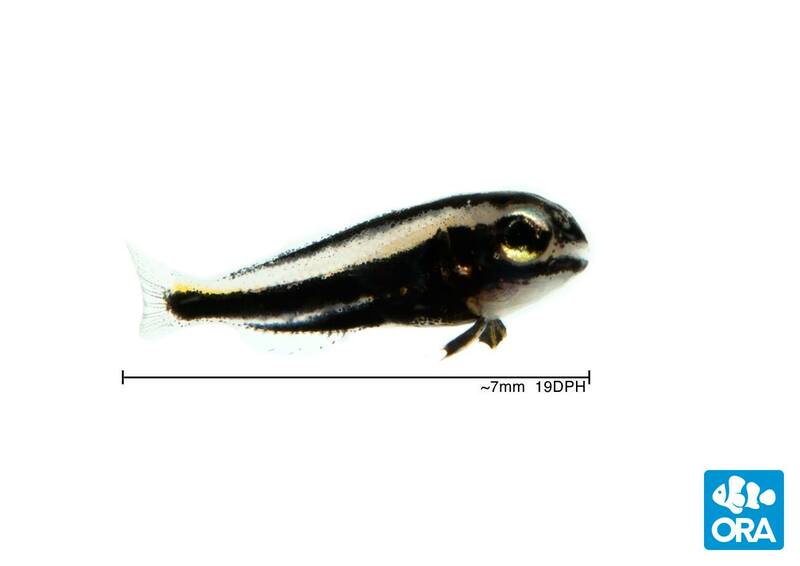 ORA’s first introduction for 2015, the Kamohara Fang Blenny, successfully spawned and reared in Fall, 2014! There are an untold number of marine fish that go unappreciated for their beauty and behavior due to the challenging nature of their collection or the remoteness of their habitat. With a keen eye for such fish, ORA has sought out such animals and worked to bring them to a broader audience. Our newest release, the Kamohara Fang Blenny [Meiacanthus kamoharai] is an exquisite example of just that fish. This elongated black and white blenny is endemic to the shallow waters off the subtropical, southern coasts of Japan. The Kamohara blenny is common in Japan but almost incomprehensibly rare in the international aquarium hobby, we believe that the majority of wild specimens in the United States are members of the ORA Broodstock Program. But not anymore. The Kamohara Fang Blenny is temperate species, naturally experiencing temperature fluctuations from 60-80 degrees each year. We have successfully spawned and raised this fish in tropical temperatures that exceed 80 degrees. Their tolerance for a wide variety of temperature ranges makes them suitable for both the typical marine aquarium and temperate tanks that are growing in popularity. With their prominent black and white patterns and Meiacanthus charm, the ORA Kamohara Fang Blenny begins shipping out worldwide next week. We would like to thank Koji Wada for collecting our broodstock in August of 2013. You can see a photo of him in action here on Reefbuilders. The ORA Kamohara Blenny (Meiacanthus kamoharai) is found in the shallow waters off the subtropical, southern coasts of Japan. 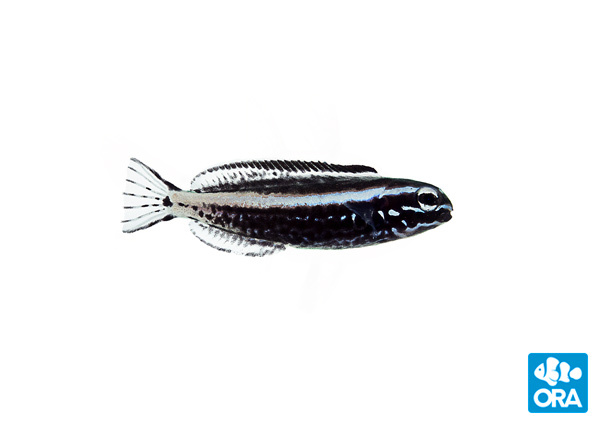 As juveniles, their black bodies are scribbled with intricate patterns of white and electric blue lines. As they mature, they undergo a transition, shifting from erratic monochromes to a more minimalistic horizontal white stripe against their charcoal bodies. Their facial patterns develop into just a spatter of bright white dots. The Kamohara Blenny is reported to reach a size of 6cm but we have found that our broodstock fish reach twice that length, with males noticeably larger than females. Kamohara Blennies are robust fish, similar to the Striped Blenny rather than the delicate appearance of Blackline or Canary Blennies. These fish consume a diet of zooplankton in the wild, but aquacultured fish readily take pelleted and prepared foods. Editor’s Note – ORA teased their success with the Kamohara Fang Blenny on October 17th, 2014, with this single post-larval image posted on their Facebook page. The post-larval Meiacanthus kamoharai, shown here at only 19 days post hatch. ORA’s success made it onto our latest 2015 Captive-Bred Marine Fish Species List, and was also shown in the January/February 2015 CORAL Magazine Rarities Section.